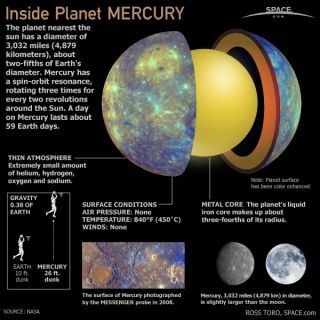 Mercury is the closest planet to the Sun in Earth’s solar system, but has no moons and no substantial atmosphere. Mercury is named after the Roman swift-footed messenger God. As the planet nearest the sun, the surface of Mercury can reach a scorching 840 degrees F (450 degrees C). However, since this world doesn't have a real atmosphere to entrap any heat, at night temperatures can plummet to minus 275 degrees F (minus 170 degrees C), a more than 1,100 degrees F (600 degree C) temperature swing that is the greatest in the solar system. Mercury is the smallest planet — it is only slightly larger than Earth's moon. Since it has no significant atmosphere to stop impacts, the planet is pockmarked with craters. For instance, about 4 billion years ago, a roughly 60-mile-wide (100-kilometer-wide) asteroid struck Mercury with an impact equal to 1 trillion 1-megaton bombs, creating a vast impact crater roughly 960 miles (1,550 kilometers) wide. Known as the Caloris Basin, this crater could hold the entire state of Texas. NASA's $446 million Messenger probe (which stands for MErcury Surface, Space ENvironment, GEochemistry, and Ranging) was launched in 2004 and has been in orbit around Mercury since 2011.